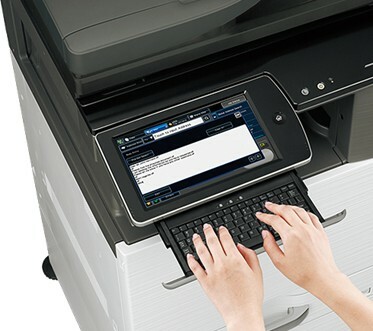 After the MX-2640N, MX-3140N and MX-3640N launched in March 2013, now the 41 and 51 pages per minute models from Sharp are up for renewal. The MX-4140N, MX-4141N, MX-5140N and MX-5141N benefit from the latest features the manufacturer has brought to its A3 color range. Sharp are highlighting the availability of True PS3 as standard, compared to only emulated PS3 on the preceding models, and this was an additional option. The scan speeds of the models with the double-scan head (the MX-4141N and MX-5141N) have increased significantly, most of all for duplex. These two models also deliver scanning to compact PDF as standard. This feature is an option on the auto-reversing models. Media management has also been improved. All these new models can handle 300 gsm / 110 lb Cover stock from the bypass, and banners up to 48 inches, 1.2m long. As regards connectivity, worth noting that Sharp is providing WiFi access as standard. These new models will be on Your DMO in the next few days!